我一直都有練習做麵包，亦跟足所有發酵程序，用湯種法，但出來的效果有少少似muffin,很鬆散，隔一天已經很乾。 你是買supermarket 的 high grade flour or 店人店的高筋粉？(I am living in New Zealand). I don't know where I am doing wrong :( would appreciate if you could give me some advice. thanks! 如果用sunbeam 的話, 應該用basic 還是dough mode? How do you know when the 1st raise is too short or too long? I used the bread machine to do the mix and 1st raise. After it's done, I hardly can see the 薄膜. I can't tell whether it's still not ready or over-raised. 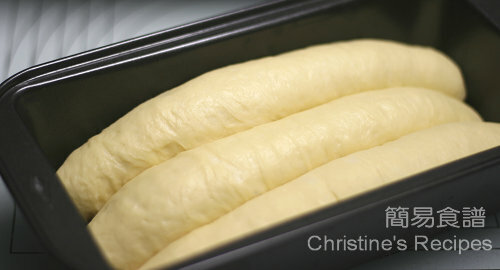 I just spot the dough doubled in size, then it's fine. 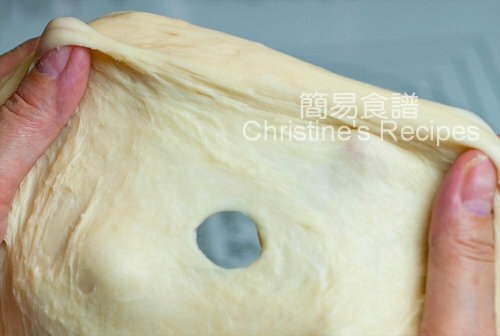 Coat your finger with a bit of flour, then poke in the middle of the dough, if the hole remains the shape, it's proofed perfectly. If the hole springs back, it needs more proofing time then. If the hole collapses, the dough is over-prooefed. 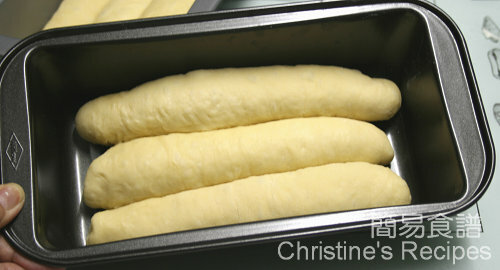 我買的高筋粉是 Defiance: White Baker's Flour. Christine 谢谢你的分享, 很详细,尤其是做面包这部分,你无私的分享,又加上多个图文并茂, 真的让我学到很多. 很感谢,感恩!让我学到很多这方面的知识. Thank you very much Christine for the wonderful recipe. 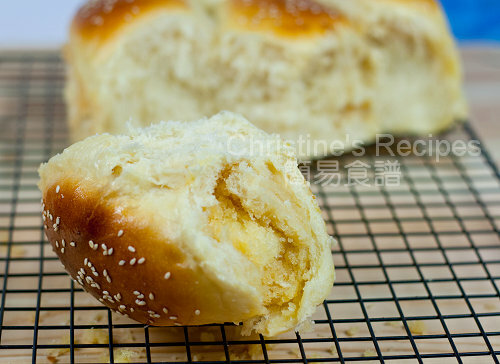 I bake this bread on Sat and it turned out soft and fluffy. Everyone in my family love it.